Elegant and polished yet family friendly, the Lincoln MKT is proof that having a larger household doesn't prevent you from riding around in style. 2017 Lincoln MKT reviews call it a "solid option" for a luxury family vehicle, noting the crossover's host of cabin amenities, as well as its refined performance, as its top benefits. This model year, the 2017 Lincoln MKT carries over unchanged, continuing to feature the updated Sync 3 infotainment system that was ushered in last year. 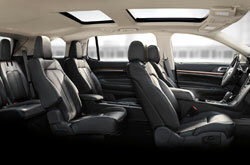 The Lincoln MKT is designed with seven seats, although opting for the available second-row captain's chairs takes seating capacity down to six. The crossover also offers 17.9 cubic feet of storage behind the third row, which is plenty of room for a load of groceries, sports gear or other cargo. The 2017 Lincoln MKT near Dallas comes in two well-equipped trims: Lincoln MKT and Lincoln MKT with EcoBoost. Starting on the entry-level trim, the crossover is outfitted with remote engine start, a power liftgate, a panoramic glass roof, adaptive xenon headlights, an auto-dimming rearview mirror, tri-zone automatic climate control, and leather seating with heating and ventilation. On the technology front, the Sync 3 infotainment system is housed in an 8-inch touchscreen, and music plays through a 10-speaker sound system. 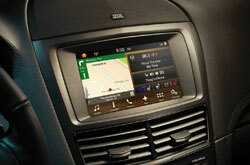 The Lincoln MKT EcoBoost adds even more amenities to the crossover, from a navigation feature with voice recognition to a 14-speaker audio system. Stand-alone options include a second-row refrigerator console, a heated and ventilated second row, and a rear entertainment system with dual 7-inch screens. Whichever trim you select, you'll be treated to a strong powertrain and comfortable handling. 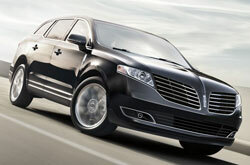 The standard Lincoln MKT employs a 3.7-liter V6 rated at 303 horsepower and 278 pound-feet of torque. Power is sent to the front wheels through a six-speed automatic transmission. 2017 Lincoln MKT reviews have no shortage of compliments for the Lincoln MKT EcoBoost's turbocharged 3.5-liter V6 engine. Boosting output to 365 hp and 350 lb.-ft. of torque, the engine is paired to a six-speed automatic, which delivers "potent acceleration," according to Edmunds.com. All-wheel drive is standard on this configuration, as is an adaptive suspension with selectable drive modes that adapt to various roadway conditions. The 2017 Lincoln MKT in Grapevine is outfitted with top-of-the-line safety equipment to give drivers added confidence. A rearview camera, rear parking sensors, automatic high beams, Sync emergency telematics and MyKey programmable teen driver settings are just a few of the crossover's standard features. Those who opt for the Lincoln MKT EcoBoost trim will have the option of adding a Technology package, which includes driver-assist features like a forward collision mitigation system with automatic braking, parallel-parking assist and lane departure prevention. 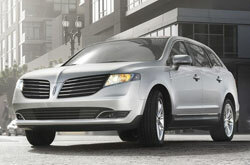 Obtain All the Latest Specifications on the LINCOLN MKT! Have the 2017 Buick Enclave, Lexus RX 350 and the Acura MDX captured your attention? Then you should also mull over buying a 2017 LINCOLN MKT in the Dallas area. 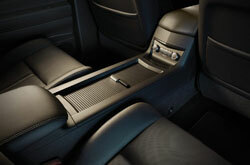 Its attention-grabbing looks and first-class in-car technologies may exceed your expectations and meet your needs. 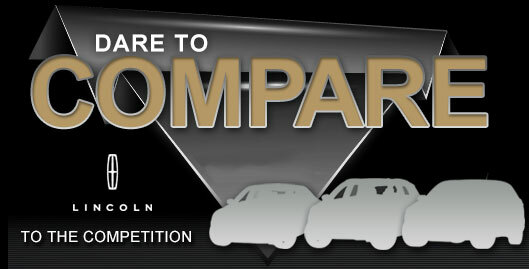 Confirm if it's ideal for you using our 2017 LINCOLN MKT evaluation as well as the included compare tool; and afterward, make sure you view current financing incentives on our website. 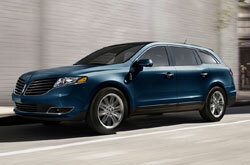 Want to see hot financial incentives on the new LINCOLN MKT? Then remember to visit us - your local LINCOLN retailer. When making your eventual buying decision, we hope our 2017 LINCOLN MKT review offers the specs you to make an educated purchase. Use our online form to schedule an appointment to test drive the LINCOLN MKT at Grapevine Lincoln in Grapevine, TX, and explore the stately model for yourself. If you're interested to see it before your visit, view its interior and see how it's equipped in the embedded video.